Steam boilers fueled by biomass like wood chips, pellets, peanut, minced shells etc .. Hourly output from 400 up to 10500 kg / h and pressures up to 35bar. The boiler, equipped with tube plates broadsides thick, has a large combustion chamber with a circular section (hearth diam. 850 mm sp. 15 mm) completely wetted and coated with refractory thickness of 60 mm into the combustion area. This mass of material to the high alumina content and a high resistance to high temperatures, allows a complete combustion at high temperature facilitating the combustion of wet material. The combustion chamber is designed for receiving the burner screw mechanical for automatic loading. The generator is equipped with large rear lid for inspection and cleaning of the ashes and a front for the possible manual loading and for the cleaning of the grid. 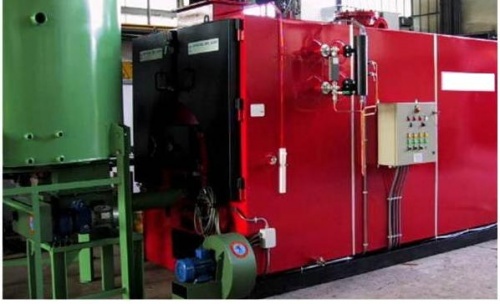 The generator, covered with insulating material with high density and encased in painted, has connections for the instruments of control of combustion and steam production, container probes control water level, the complete exhaust off valve, group Power connection for the flue duct. The generator has certified to PED 97/23 CE verified INAIL.